We had a little snowstorm yesterday, and even though time was short, I just had to bring a little sunshine and flowers into my artwork. 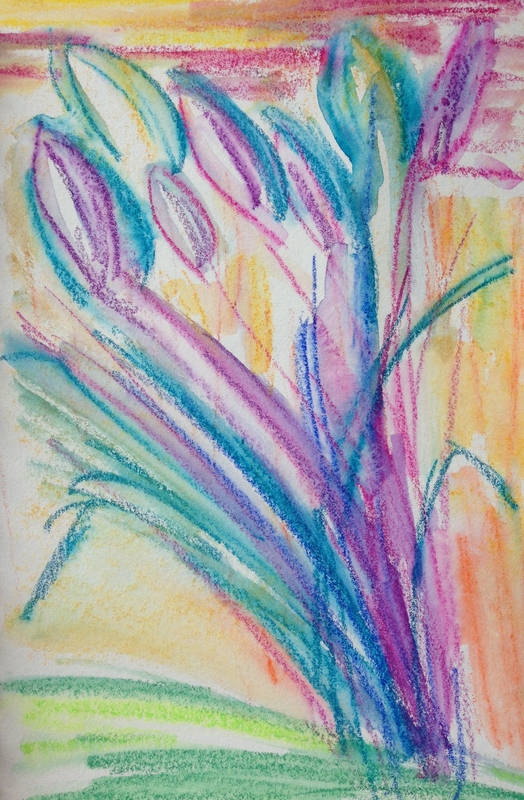 Brought to you today by Inktense blocks and Neocolor II water-soluble pastels. Enjoy! And have a wonderful Wednesday, good people. Thanks for stopping by and encouraging me with your visits and comments! It means an awful lot! Peace. What a lovely sight on this dark dreary morn that makes me want to go back to bed. Your flowers made my eyes smile. Thanks! These were so much fun to do, and so fast. This is why I love the neos so much. Fast, vibrant, easy, portable, you name it. Just love them! Glad you enjoyed. We need bright colors this time of year. Glad you’ve got some in your place too. Hi Laura, what is Inktense blocks? Is that a type of paper? Super love for your pastels, they say spring and warm sunshine to me! Certainly helps me break out of the 5 degrees fog I’m in this morning. My smallest dog jumped on my lap and stuck his head in my robe and fell asleep -hibernation seems to be the theme in my house. lol Cathe, love that story! 🙂 Inktense blocks are here: http://www.dickblick.com/products/derwent-inktense-blocks/ and I highly recommend them! They also make pencils in the same vein. Just another water-soluble medium, except the Inktense are actually ink, so if they’re fully activated and then fully dry, you can go on top of them and they don’t move. Pretty special. Glad you enjoyed this. Stay warm over there! Thank you for the colorful shine!! ❤️😃Its been cold and gray here so this is a wonderful image to start my day!! Beautiful!! Laura, these are beautiful. I love flowers drawn freely. My sketchbook is filled with futile attempts at the same. I love the colours and textures in yours. Thanks! I never know when I pick these things up how it will go, but sometimes it works out great. I think I fussed a bit much with the water and of course, no patience, so I almost made a bit of mud there, but I liked the immediacy of it. We need color right now, and the more the better so I had to post! 😀 Glad you enjoyed. Springtime tulips – beautiful pops of colors that bring hopes of a season of fresh, new beginnings. Your art does them justice! Thank you Carol! So glad you enjoyed them! Thank you for the flowers this morning. They are lovely! So glad you enjoyed them, Laura! You’re most welcome! So glad, Rachel! Meows and purrs to you! Very cheery! Love the color palette! I hope you did, Susan! Thank you! Oh, Jill, yes I did. So much fun with those two mediums; they are my faves right now for MM stuff. Really enjoying them here in February! Certain to please on a winter day. Tulips are my favorite flower, so simple is the form, tightly closed in the beginning and in only hours will open to celebrate spring. Thanks you for sharing this lovely symbol of spring Laura. Thank you, Connie, for that very kind observation and comment. Have a wonderful night! beautiful, the colors are so spring-like! Lines and colors….and Voilà, instant, beautiful flowers! I get amazed with each one of your drawings, Laura, such talent! Donna, thank you so much! Honestly, if you had a set of these Neocolors…..you could really do this. You don’t have to be an artist to do this. You can see how basic the lines and shapes are; this isn’t a drawing effort at all. It’s just getting some life on the paper, mixing up the colors a bit. You’d be amazed at what those Neos can do. I’m really glad you enjoyed it! Sounds wonderful! We’re in the teens! Would you prefer it warmer? I think 60s-70s is perfect.